Carlo Scarpa’s Olivetti showroom is by far my favourite piece of commercial architecture. When Sigrun and I visited the showroom in September, we were both in awe of the complexity and easiness of the architecture. It is a crafted and intricate work but there is also a disarming lightness of touch. It is rare to see such control of material and form without rigidity and with plenty of inspired compromise – there is an almost playful relation to the pre-existing structure. By today’s standards, the shop is modest in scale – around 100 square metres – but Scarpa has created an extensive and varied sequence of spaces that lead through, around and over the displays of Olivetti merchandise. 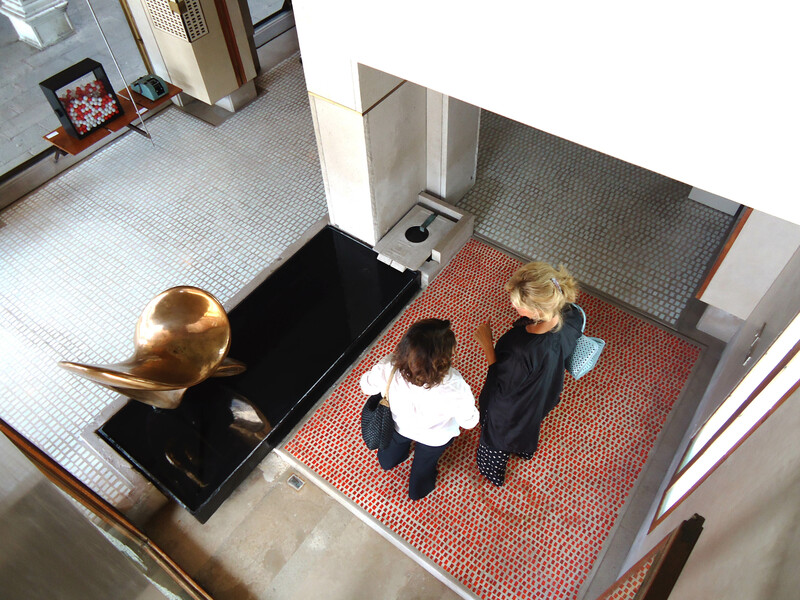 You enter the showroom through a pair of glazed pivot doors, passing a Bronze sculpture (Nudo al sole by Aberto Viani) positioned above a plinth of black Belgian marble – the shallow, gently moving water gives the marble basin an intensely mirrored surface. The sculpture is an integral part of the architecture, forming a fulcrum of the composition. I have always been interested in working with artists and this is a particularly good example of why collaboration is so important. Viani’s artwork is part of the structure of the space and the architecture responds to it – you can tell that artist and architect had a close relationship, and in this case both the art and the architecture are elevated by it. Changes in the height of the space and small level changes define distinct areas without interrupting views through the showroom. Even the central stair, which leads to the mezzanine level, maintains this impression of transparency – its overlapping stone treads, held apart by brass rods. Climbing the stair you reach a stone landing, facing the double-height wooden screen to the water-side façade, the lower half of which pivots to give access to the canal (Quite the service entrance!). From the landing you can access 2 long balconies clad in rich African teak. The left-hand balcony is pulled back from the party wall with slender display shelves spanning the gap. On the ground floor, the rosewood display shelves are hung from the mezzanine above on stainless steel rod, and are pushed back from the façade by tapered and angled feet. These hovering displays face the Piazza and would have offered Olivetti’s latest innovations to the passing trade. Their transparency allows views through the showroom and to the stair – suggestive of further delights above. Scarpa was not afraid to alter the façade and made confident but fitting alterations. There is easiness to the façade treatment – he has not been too careful with the existing structure, fixing a new slender, timber fascia directly onto the existing stonework. The arcade is formally robust and can well accommodate this form of intervention – although I do wonder what today’s planners would make of his proposals! New windows were added and existing apertures widened to allow maximum views to and from the Piazza and enhancing the proximity of the passing trade to the technology within. The signage has not been treated as an afterthought, but fully integrated into the façade – with the Olivetti name and logo literally carved into the stonework. As the text above shows it is hard not to be enchanted by the Olivetti showroom, obsessed even! The showroom is a pretty unusual commercial space. The display is pretty static and the products; typewriters and calculators were the original objects on display, become a part of the architecture. The Olivetti object here is elevated to a higher level, this demonstrated by the Nudo al sole by Alberto Viani at the entrance of the shop, the typewriter/calculators and “the Nudo” are equal in the hierarchy of things. This is achieved by the design of the display apparatuses that are of the same materials as the various steps, screens, grates and other “practical” details in the showroom. This in turn also happens on a greater scale as the “new” (in Venice it can still be called new!) showroom fits seamlessly into the city just as the objects in the boutique. Materials used are local and foreign mixed harmoniously together, as mentioned before, venetian stucco with african teak and ebony, perhaps reminding us that this place in which we find ourselves is a very cosmopolitan city, which historically has had influences from all over the world. Modern elements and traditional/classic (marble and stucco traditionally used in the Venetian Palazzo with the contemporary fluorescent lighting). The big (measurements) glass frame in the facade sits perfectly content between the two existing classical colomns. The traditional “Cancello” main door is very reminiscent of the traditional Venetian ones, but is still designed in the same way as the window screens and various other details in the shop and behind a very crisp modern glass door emerges. A last mention is reserved for the Olivetti sign on the side facade carved into a large stone plate, the building block of the surroundings, in the “futuristic” Olivetti font, which really stitches together the new in the old…. The shop is in this way balanced with its very historical surroundings. Olivetti here represents the future, a new way of living but Scarpa has presented this not like many of the Modernists did with a break from the past but by inserting the past into the future or vice versa and so fusing the two into a balanced continuity. 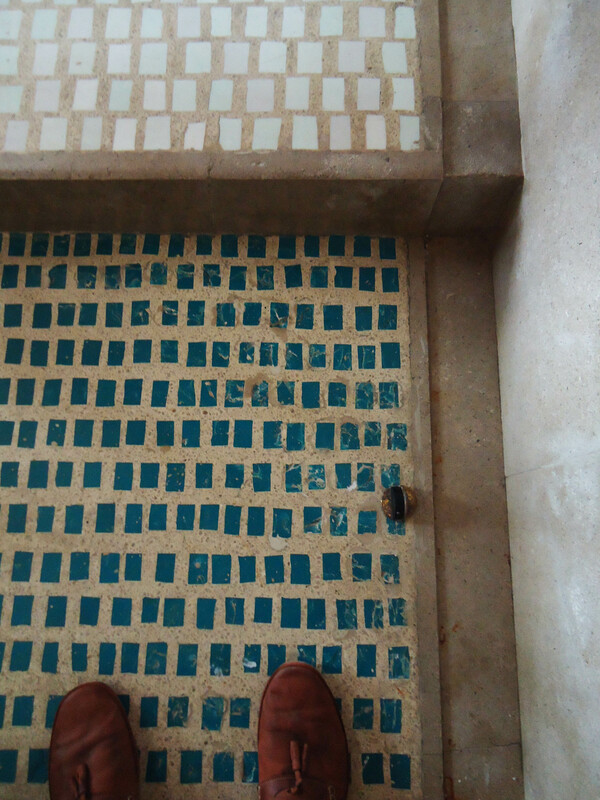 There is something extremely modern with this attitude, perhaps this is why Scarpa´s work is so fascinating still.